“It has taken nearly 15 years, but here I am – Executive Chef of a busy, quality restaurant in the middle of downtown Manhattan. Not too shabby, but maybe I could take a few moments to reflect back on what it took to reach this goal.” This is a reflection that many chefs have at that point in their career when it seems like all of the hard work has finally paid off. This is a frequent reflection, yet too many have failed to learn what their new role should be now that they have arrived. We all had to start somewhere. It may have been in the dishpit (probably the springboard for most of us), maybe it was as a commis to the prep cook, or maybe it was that first kitchen job after graduating from culinary school. Now that you have a place in the kitchen – what’s next? Let’s take a look at what it is like at three different levels in your development, how you should approach each level in your career, and along the way sink your teeth into the lessons to be learned. LISTEN – Pay close attention to what the chef asks for, what his or her standards are, and the expectations of each task that you perform. Listen to the sounds of the kitchen, the cadence of activity, the level of tension in the air, and that sense of urgency that typically heightens, as dinner hour looms closer and closer. ACCEPT – You haven’t been here long enough to question or offer suggestions. In these early days it is important to accept the tasks that you are assigned, the schedule that you are given, the speed with which you are expected to perform, and sometimes even the disdain for the quality of your workmanship. WATCH AND LEARN – The beauty of this level is that you will never have a better opportunity to absorb what is going on, to question with your eyes, to take notes, and to learn how everyone else who is more seasoned than you, approaches his or her job. The learning curve here should be very steep. APPRECIATE – Show that you are grateful for the opportunity to learn something new each day. Take a few seconds to thank people who show you the way and demonstrate how grateful you are by burning these lessons into your subconscious and applying these new methods to your own work patterns. BE HUMBLE – No matter what you know, what you think you know, how you were taught to do things at that last restaurant or in culinary school – put it out of your mind. What you don’t know is how it is done in this restaurant and how this chef wants each task performed. There will be time in the future for your input, ideas, and brilliant display of skill – just not yet. RESPECT – You are fortunate to be here – this is, after all, someone else’s kitchen, pride and joy, and reason for existence. Show respect from day one for the space, the equipment, the people, the history of the operation, the menu, the signature dishes, the flavor profile that reflects on the chef’s reputation, the ingredients and their source, and the customer who spends money so that everyone in our new work home can receive a paycheck. BE COST CONSCIOUS – You may not know this yet, but it is very difficult for restaurants to make a profit. Every piece of food that you waste or handle inappropriately will quickly eat away at the restaurants profit. Demonstrate right from the beginning that you are aware and care. Don’t waste, and make sure that you rotate, date, and handle all food in the fashion that the chef dictates. COMMIT – Be there! Give 100% every hour of every day that you are on the job. Read about food on your day off and bring in a few questions for the chef so that he or she knows that you are taking this career seriously. Work extra shifts when needed and request opportunities to work extra when something new and interesting is taking place. If there is an opportunity to learn – you will want to be there. BE PATIENT – This level will not last forever as long as you stay committed and demonstrate your serious approach towards cooking and working together with your team. That next opportunity will come when you are ready. Prep cooks become line cooks, become sous chefs and chef de cuisine, and eventually, when your skill set is balanced you just might become the chef in this or another property. The day will come – be patient. You have paid your dues and earned a stripe on the day that the chef says that you will start shadowing one of the line cooks. A space will be opening up in the schedule and the chef wants to see if you have what it takes. This is the big league – the show. This is where the pirates roam and real cooking takes place. No longer relegated to recipes – now you are expected to “know” how to cook. What do I need to do to adapt? BE READY – Line work is really all about mise en place. Do you have it together? You cannot, ever, run out of prep once those tickets start flying off the printer. Do or die – make sure you are tight and ready to go. ORGANIZE YOUR HEAD – The chef begins to bark out the orders, line cooks need to zero in on everything that is said, categorize those thoughts, prioritize steps, keep track of the state of each dish, focus on seasoning, and be ready, always ready when the call is: “Picking up on table 34!” – Yes chef”. BE FAST – The line is for speed demons. “Where is that shrimp dish? I have a blank space in the pass – get on it!” If you get behind, the night is over. BE CONSISTENT – With all of this chaos there can be no room for crappy food or inconsistent product. Every dish, every time – the same flavor profile, the same look, the same plating. No excuses. KAISEN – (Constant state of improvement). As good as you were at your station last night – make it better tonight. The bar will always be set higher and higher. OWN IT – Your station, your menu items, your plating, your mise en place, your wins and your losses. Others may help to get you out of the weeds, but it is your responsibility – don’t ever point a finger at someone else. 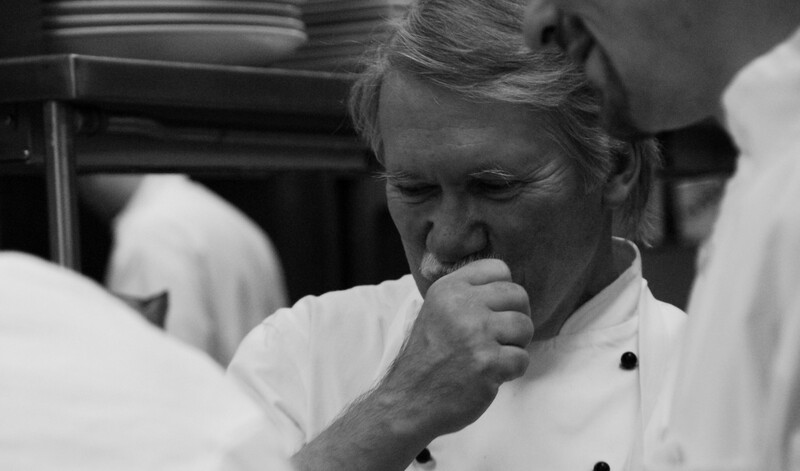 LISTEN -Just as you listened as a young prep cook, now as a chef you must take the time to listen to your employees. Don’t just hear the noise –listen to what they have to offer. This will build trust. ACCEPT – Accept the fact that you don’t know everything. As a prep cook you needed to accept your role and your assignments, now it is your turn as a chef to accept a new role of mentor, teacher, trainer, and problem solver. WATCH AND LEARN – You are the guide on the side, the one who trains but then lets the young cooks fly and find their own level. As a guide you will be amazed at how much you can learn from them. APPRECIATE – Appreciate the opportunity that you have to express yourself through your staff and make a difference in their careers and lives. Appreciate all that you have learned over the past seven years and how much you will continue to learn. BE HUMBLE – Just because you have the office and the title doesn’t make you any better than anyone of your employees. You are able to keep your position and build your brand because of those hard working prep and line cooks, dishwashers, and service staff. BE COST CONSCIOUS – Now the buck stops with you. If you train your staff to care as much about the cost of goods as you do, then the restaurant stands a chance of making a profit. Set the tone. COMMIT – You make the schedule, but the work ethic of others will be a shadow of the effort that you put in every day. To be the chef means that you will always be the hardest working person in the kitchen, the one who has committed him or herself to a life in the kitchen. BE PATIENT – Finally, just as you were told to be patient, knowing that if you stay the course, then that chef job could be yours – so too should you be patient with the next crop of young cooks hoping to fill your shoes in the future. Work with them, teach them. Be their mentor, and push them to reach their potential. IF YOU ARE INTERESTED IN MORE STORIES ABOUT THE KITCHEN AND THE CHALLENGES THAT WE FACE, THEN ORDER YOUR COPY OF: “The Event That Changed Everything”.